Young's Literal: And why dost thou behold the mote that is in thy brother's eye, and the beam that is in thine own eye dost not consider? The present tense pictures continual action as if we can't get our eye off the speck in the other person's eye! Speck (mote, KJV) (2595) (kárphos from kárpho = to dry or wither) refers to anything that is dry and light, such as straw, stubble, chaff, a little splinter of wood, a mote. It describes any tiny bit of dry material that might blow into the eye, such as a speck of dust, sawdust, wool, etc. Kárpho could refer to almost any tiny bit of substance. Figuratively kárphos refers to some slight moral defect seen in another. The self-righteous man is likely to see these, while being unconscious of greater evils in himself. As someone has well said fault-finders seldom find anything else. are to refrain from hypercritical, condemning judgment. There is a universe of difference between being discerningly critical and hypercritical. A discerning spirit is constructive. A hypercritical spirit is destructive. The person with a destructive, overcritical spirit revels in criticism for its own sake. He expects to find fault, like the man who sat watching his preacher neighbor nail up a trellis in his backyard. The preacher, seeing him watching intently from his yard, asked, "Trying to pick up some pointers on carpentry?" To which his neighbor replied, "Nope. Just waiting to see what a preacher says when he hits his thumb." When a critic discovers faults in another, he feels a malignant satisfaction and always sees the worst possible motives in the other's actions. The critical spirit is like the carrion fly that buzzes with a sickening hum of satisfaction over sores, preferring corruption to health. One of the most prominent characteristics of this critical, fault-finding person is that he predictably focuses on things that are of little importance (cf "speck") and treats them as matters of vital importance. Within the church this takes bizarre forms - judging the spirituality of a young couple by observing whether they spank their children with a bare hand or an implement, judging others by where they sit in church or the Bible version they carry or whether their theology agrees with the critic's point for point . . . and so it goes! There is something in yourself that is worthy of your consideration, something that you ought to consider, it big, blinding beam in your own eye. As for the mote that is in your brother’s eye, there is no need that you should even see it. Why beholdest thou it? Charity is ever a little blind to the faults of others, for it remembers so well its own. Many are like barbers, that trim all men but themselves. Notice (2657) (katanoeo [word study] from kata = down [kata can be used to intensify the meaning] + noéo = think) means literally to put the mind down on something and so to observe or consider carefully. It means to fix one’s eyes or mind upon and to perceive clearly. Katanoeo means to look carefully, cautiously, observantly. The idea is to think about something very carefully or consider closely which denotes the action of one's mind apprehending certain facts about a thing so as to give one the proper and decisive thought about the thing considered. The hypocrite continually (present tense) fails to look carefully in the mirror and make a self-examination. Jesus is illustrating that it so easy to turn a microscope on another person's sin while we look at ours through the wrong end of a telescope! We use some strong term for someone else's sin but a euphemism for our own (Click here for some pithy examples!). Katanoeo - 14x in 14v - Matt 7:3; Luke 6:41; 12:24, 27; 20:23; Acts 7:31f; 11:6; 27:39; Rom 4:19; Heb 3:1; 10:24; Jas 1:23f. NAS = consider(4), contemplated(1), detected(1), look(1), look more closely(1), looked(1), looks(1), notice(2), observe(1), observing(1). Log (1385) (dokos) refers to a piece of heavy timber such as a beam used in roof construction or to bar a door. Vine says dokos refers to the "beam supporting the roof of a building." The “beam” is thus a large, hewn timber used in the structure of a building and the point is that the man behind that timber cannot see and thus cannot determine the true nature of things because he is blinded. Jesus is making the point that we are generally far more tolerant to our own sin than we are to the sin of others. Jesus doesn't say that it is wrong for us to help our brother with the speck in his eye. It is a good thing to help your brother with his speck, but not before dealing with the plank in your own eye. Bread and Butter - A small-town baker bought his butter from a local farmer. One day he weighed the butter and concluded that the farmer had been reducing the amount in the packages but charging the same. So the baker accused the farmer of fraud. "Do you have measuring weights?" "No sir," replied the farmer. "How then do you manage to weigh the butter that you sell?" "When the baker began buying his butter from me, I thought I'd better get my bread from him. I have been using his 1-pound loaf as the weight for the butter I sell. If the weight of the butter is wrong, he has only himself to blame." Making hasty, unjust judgments about others is sin. The Pharisees of Jesus' day seemed to be especially adept at this. They would try to elevate themselves by tearing down and slandering people's character. Not only is this a sign of pride and self-satisfaction, but it is certain that we will be judged in a similar manner. Jesus said, "With what judgment you judge, you will be judged; and with the measure you use, it will be measured back to you" (Mt. 7:2). The fault we see in another may be the reflection of our own. Can You Hear Me? - A man was having difficulty communicating with is wife and concluded that she was becoming hard of hearing. So he decided to conduct a test without her knowing about it. One evening he sat in a chair on the far side of the room. Her back was to him and she could not see him. Very quietly he whispered, “Can you hear me?” There was no response. Moving a little closer, he asked again, “Can you hear me now?” Still no reply. Quietly he edged closer and whispered the same words, but still no answer. Finally he moved right in behind her chair and said, “Can you hear me now?” To his surprise and chagrin she responded with irritation in her voice, “For the fourth time, yes!” What a warning to us about judging! Speck Inspectors - Why do some people seem to be experts at finding a speck in the eye of someone else? (Mt 7:3). Is it because the fault stands out like Santa Claus at a Fourth of July picnic? No, they deliberately search for specks because they're looking for something to criticize. The chief speck inspector is Satan. When the Lord called his attention to the good character of Job, the devil responded with a raised eyebrow. "Does Job fear God for nothing?" he smirked (Job 1:9). He insinuated that Job was good only because God made it pay to be good. Satan was so sharp-eyed he could see a speck that wasn't there. Faultfinders are never reliable fact-finders. The enemies of our Lord even tried to find fault in the only One who ever lived a perfect life (Mt. 12:24; Lk. 7:34; Jn. 9:16). Because they looked for the worst, they were blind to the best. Do we really understand the wickedness of faultfinding? It's a cruel habit that damages ourselves and those around us. before you look for specks in others. It is strange how oblivious we can be of our own faults and blemishes, and how clearly we can see those of other people. One old writer says: “Men are more apt to use spectacles than looking-glasses — spectacles to behold other men’s faults than looking-glasses to behold their own.” A man can see a little speck of dust in his neighbour’s eye while utterly unaware of the great beam in his own eye. He observes the most minute fault in his brother while unconscious of his own far greater fault. We would say that a beam in a man’s eye would so blind him that he could not see the mote in another’s eye. As our Lord represents it, however, the man with the beam is the very one who sees the mote and thinks himself competent to pull it out. So it is in morals. No man is so sharp at seeing a fault in another as he who has the same or a similar fault of his own. A vain man is the first to detect the indications of vanity in another. A bad-tempered person is most apt to be censorious toward a neighbour who displays bad temper. One with a sharp uncontrolled tongue has the least patience with another whose speech is full of poisoned arrows. A selfish man discovers even motes of selfishness in others. Rude people are the very first to be hurt and offended by rudeness in a neighbour. So it is always. If we are quick to perceive blemishes and faults in others, the probability is that we have far greater blemishes and faults in ourselves. This truth ought to make us exceedingly careful in our judgments and exceedingly modest in our expressions of censure, for we really are telling the world our own faults. It is wiser, as well as more in accordance with the spirit of Christ, for us to find lovely things in others, and to be silent regarding their faults. And found itself a weed. "Why beholdest thou the mote that is in thy brother's eye? . . . First cast out the beam out of thine own eye; and then shalt thou see clearly to cast out the mote out of thy brother's eye."--Matt. 7:3, 5. THE contrast is between bad critics and good surgeons. On the one hand there is a man with very defective eyes passing judgment on another man's sight. The partially blind is presuming to be a judge of other people's eyes. It is a case of a blind oculist. On the other hand, there is a man whose eyes are healthy and full of light, and. he is gently removing a spell from his brother's eyes, and restoring him to cool and normal sight. So that the contrast presented by our Lord is not merely a contrast between a good critic and a bad critic. The word passes beyond the circle of criticism to the realm of service. And Christ presents an ideal to us, and His ideal is that of a man whose eyes are full of discernment, whose heart is full of gentleness, and whose hands are disciplined in helpfulness, and the man is busy restoring sight to others. Our eyes are raised to contemplate a chivalrous surgeon engaged in ministries of emancipation. "If any man be overtaken in a fault, ye which are spiritual restore such a one in the spirit of meekness." It is the work of the noblest surgeon. Now, our Lord says that the first necessity to becoming a good surgeon is to acquire true vision. We cannot take splinters out of another man's eyes if our own eyes are filled with planks. "First cast out the beam!" But the trouble is, we do not always know that the beam is there. That is the subtle, deadening influence of perverted sight. A man's eyes can be half-full of planks, and yet he may think he has perfect sight. We cannot see ourselves. A man can have a woodyard in his eyes and not know it! How much arrogance a man's eyes can carry, and yet he may not be aware of the load! How much prejudice may dwell in his eyes, and he may be entirely ignorant of the harmful tenants! How much ignorance may be piled up in his eyes, and yet he may assume they are full of enlightenment and knowledge How much sin may be gathered in his eyes, and yet he may walk and talk as though he were pure! And so it is a great problem how we are to see the beams that are in our own eyes. And the only way to see them is to go where there is plenty of light. Where can we find the light? We cannot find it in the ordinary light of conventional social standards. They will not reveal us to ourselves, for that sort of dim, dull light brings nothing into sight. We need a stronger light. Who has not seen shopmen bringing their goods to the doors of their shops in order to have their customers see them in the bright sunshine? The dull background, with its twilight, does not reveal the things in their true colours. Suppose we could bring our lives into a sunshine where their real colours would be revealed. Suppose there were some "burning bliss" in which everything stands unveiled. And that is just what there is, and that is just what we can do. We can bring our lives into the light of God's holiness. We must get into this light; and to see our faults in that light, and to cry out to God for their removal, is to have God for an immediate ally in the work of their destruction. Greek: e pos ereis (2SFAI) to adelpho sou, Aphes (2SAAM) ekbalo (1SAAS) to karpos ek tou ophthalmou sou, kai idou (2SAMM) e dokos en to ophthalmo sou? Young's Literal: or, how wilt thou say to thy brother, Suffer I may cast out the mote from thine eye, and lo, the beam is in thine own eye? Or how can you say to your brother, `Let me take the speck out of your eye,' and behold, the log is in your own eye? : e pos ereis (2SFAI) to adelpho sou, aphes (2SAAM) ekbalo (1SAAS) to karpos ek tou ophthalmou sou, kai idou (2SAMM) e dokos en to ophthalmo sou? A blind man cannot be a good oculist; he should see well who tries to mend other people’s eyes; but with a beam in one’s own eye, it must be poor work to attempt to take motes out of the eyes of others. This does not prevent our using reproof and rebuke when they are needed. Even under the Law, the command was given, “&Thou shalt not hate thy brother in thine heart: thou shalt in any wise rebuke thy neighbor, and not suffer sin upon him,&” as if it were a kind of hatred to avoid the duty of kindly and gentle rebuke. That is a very different thing from exposing the faults of others, and aggravating and exaggerating the faults of others, as, alas, so many do! Oh, how much misery might be saved in the world if the scandal-market were not so brisk! Perhaps tongues would not move so fast if eyes were used to a better purpose. This is a very common proverb among the Jews: In the measure that a man measureth, others measure to him. And this also was a known proverb among them: "It is written in the days when they judged the judges, that is, in the generation which judged their judges, When any [judge] said to another, Cast out the mote out of thine eye; he answered, Cast you out the beam out of your own eye," etc. A Chinese proverb says do not remove a fly from your friend’s forehead with a hatchet! This was a common proverb familiar among the Jews that referred to the one who with greater sins, reproved the lesser faults of others. Tragically these fault-finders seldom find anything else! Jesus was referring to the hypocrisy of people who try to improve others while remaining blind to their own faults. This type of pious judgmental behavior is often a form of self-boasting. Behold the log...in your own eye - Stated another way (as someone has said), when looking for faults, use a mirror, not a telescope. Speaking of logs - When the family returned from Sunday morning service, father criticized the sermon, daughter thought the choir's singing atrocious, and mother found fault with the organist's playing. But the subject had to be dropped when the small boy of the family piped up: "But it was a good show for a nickel, don't you think, Dad?" The contrast between ‘speck’ and ‘log’ is a hyperbole or purposeful, extravagant exaggeration. Can you picture a fellow with a beam (a log, a tree trunk, a railroad tie or a timber) sticking out of his eye? And he is trying to help another fellow get a speck of dust out of his eye! What a ludicrous scene which is exactly the picture Jesus sought to portray. The "log" judge would end up poking out the eye of the "speck" victim. The implication is that the judge often has in his or her own life a much larger edition of the same fault they are judging in others and the victim can end up being hurt badly when the "speck judge" tries to straighten them out before straighten himself or herself. 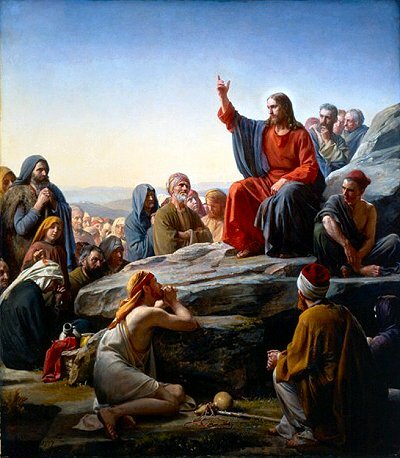 Jesus uses this absurd picture to rebuke officiousness (the volunteering one’s services where they are neither asked nor needed and thus are annoying) in correcting small faults of others, while cherishing greater ones of our own. Fallen men and women are still in the speck removal ministry. One of the hardest things we have to learn is that when we point a finger at others, we point four at ourselves! David in judging the rich man's sin ("speck"), had condemned himself ("log")! Did you read the true story about a Connecticut city, where 53 residents of a certain neighborhood signed a petition to stop reckless driving on their streets. The police set a watch. Guess what happened! A few nights later five violators were caught. All five had signed the petition! Shall I," it mused, "come out?" "I don't care to be a rose. It has thorns. I have no desire to be a lily. It's too colorless. And I certainly wouldn't want to be a violet. It's too small, and it grows too close to the ground." The apostle Paul indicated in Ro 12:3 (note) that we are not to think of ourselves too highly. Rather, we are "to think soberly." To the church in Philippi he wrote, "Let nothing be done through selfish ambition or conceit, but in lowliness of mind let each esteem others better than himself" (Php 2:3-note). When we fail to follow these instructions and begin finding fault with others, we are actually passing judgment on ourselves (Mt. 7:1, 2; Ro 2:1, 2-notes; Ro 2:3-note). Helpful Humor - Humor can be cruel and offensive, but it can also be kind and helpful. I have used it in sermons to make a point or in meetings to break the tension. I have also profited from humor when it pointed out my faults. Recently, while watching a film series on family living, I laughed at the comical examples of foibles and failures to which we as husbands are so prone. Yet even though I was amused, I saw enough of myself in these funny situations to feel convicted. As a result, I think I'll be a better husband from now on -- and after more than 50 years of marriage! God gave us the gift of humor and the capacity to laugh. I believe Jesus had a twinkle in His eye when He said that a person should take the plank out of his own eye before trying to remove a speck of sawdust from the eye of someone else (Mt. 7:4). I can just see His listeners smile and hear them laugh softly. But I'm sure they also understood His point, and some may have been convicted about their own judgmental attitude. Similarly, the writer of Proverbs portrayed a lazy man in three exaggerated word pictures (26:13-16). They are humorous, but they drive home a solemn warning. Humor can make a serious difference. Logs And Dust - Jesus sometimes used humor to drive home a truth. Think of the serious point in His humorous description in our Bible reading today. He accused the religious leaders of being like a man with a great big beam in his eye offering to remove a tiny speck from his brother's eye (Mt. 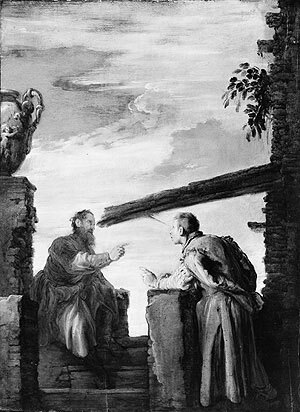 7:1-6). How ludicrous! We are so blind to our own faults but think we can detect the slightest inconsistency in others. We carry two measuring sticks—one for ourselves and one for others. We have two different sets of words to describe our actions. A "bad temper" in another, we call "righteous indignation" in ourselves. "Stinginess" in others is "frugality" when we practice it. In addition, we tend to blame others for our own faults. A husband and wife, married 20 years, were driving along, when she suddenly remarked, "You know, John, you are not like you used to be in our early married years—romantic, loving, and affectionate. Then we used to sit close to each other when we went driving, and now you sit so far from me." The husband gently replied, "Mary dear, I am sitting exactly where I always sit when I drive." takes no delight in the faults of others. Greek: hupokrita, ekbale (2SAAM) proton ek tou ophthalmou sou ten dokon, kai tote diablepseis (2SFAI) ekbalein (AAN) to karpos ek tou ophthalmou tou adelphou sou. Young's Literal: Hypocrite, cast out first the beam out of thine own eye, and then thou shalt see clearly to cast out the mote out of thy brother's eye. The irony of the "speck removal ministry" is that a man often condemns most vehemently in others is that to which he is himself prone! Be careful where you throw stones! At the bottom of all censoriousness lies hypocrisy. An honest man would apply to himself the judgment which he exercises upon others, but it usually happens that those who are so busy spying Out other people’s faults have no time to see their own; and what is this, at the bottom, but insincerity and hypocrisy? The judging faculty is best employed at home. Our tendency is to spy out splinters in other men’s eyes, and not to see the beam in our own. Instead of beholding, with gratified gaze, the small fault of another, we should act reasonably if we penitently considered the greater fault of ourselves. It is the beam in our own eye which blinds us to our own wrong doing; but such blindness does not suffice to excuse us, since it evidently does not shut our eyes to the little error of our brother. Officiousness pretends to play the oculist; but in very truth it plays the fool. Fancy a man with a beam in his eye pretending to deal with so tender a part as the eye of another, and attempting to remove so tiny a thing as a mote or splinter! Is he not a hypocrite to pretend to be so concerned about other men’s eyes, and yet he never attends to his own? Jesus is gentle, but he calls that man a “&hypocrite “& who fusses about small things in others and pays no attention to great matters at home in his own person. Our reformations must begin with ourselves, or they are not true, and do not spring from a right motive. Sin we may rebuke, but not if we indulge it. We may protest against evil, but not if we wilfully practice it. The Pharisees were great at censuring, but slow at amending. Our Lord will not have his kingdom made up of hypocritical theorists, he calls for practical obedience to the rules of holiness. After we are ourselves sanctified, we are bound to be eyes to the blind, and correctors of unholy living; but not till then. Till we have personal piety, our preaching of godliness is sheer hypocrisy. May none of us provoke the Lord to say to us, “&Thou hypocrite&”! There may be, dear friends, a great deal of hypocrisy about us, of which we are not aware, for when a man sees a fault in another, and tells him of it, he says, “&You know I am a very plain-spoken person; there is no hypocrisy about me.&” Well, but there is, and, according to the Savior’s description, this may be sheer hypocrisy because meanwhile in your own eye there is something else worse than you see in your fellow, and this you pass over, and this is simply untruthful dealing, and it amounts to hypocrisy. If you were really so zealous to make people see, you would begin by being zealous to see yourself, and if you were so concerned to have ,all eyes cleansed from impurity, you would begin by cleansing your own, or seeking to have them cleansed. Remember that it is only a short step from critical to hypocritical. Hypocrite (5273) (hupokrites from from hupó = under, indicating secrecy + krino = to judge) (See related word hupokrisis) describes one who acts pretentiously, a counterfeit, a man who assumes and speaks or acts under a feigned character. Hypocrite had its origins in Greek theater, in which it described a character who wore a mask. In the New Testament a hypocrite normally refers to an unregenerate person who is self-deceived. Unless prompted by the right motives, religious activities, including doing good deeds to others, are of no real spiritual value and receive no commendation from God. It does matter greatly why we do what we do. The hypocrite has a duplicitous life – often without realizing it – giving appearance of one motive when in reality a hidden motive drives him. The most difficult type of hypocrisy to spot is not in someone else but is in ourselves (even if it's a huge log)! We can often spot ill motives (specks) in someone else and be judgmental but quickly make excuses for similar motives in our own heart! And remember that it is but a short step from the critical to the hypocritical. One who feigns to be what he is not; one who has the form of godliness without the power (cf 2Ti 3:5-note), or who assumes an appearance of piety and virtue, when he is destitute of true religion (cf Jas 1:27-note for definition of "true religion"). Clean your fingers before you point at my spots. First (4413) (proton from protos = leading, foremost, prominent, most important) means first in time, place, order, importance. In short, give priority to your own "eyesight" before looking at others. Take out (1544) (ekballo from ek = out + ballo = throw, cast) means literally to cast out, a word that includes a sense of to force, thrust or drive out. The aorist imperative commands urgent, effective attention. Do this now! Do it first if you want to be a "speck minister"! As William Secker said "They are fittest to find fault in whom there is no fault to you be found." Ekballo - 81x in 75v - Matt 7:4f, 22; 8:12, 16, 31; 9:25, 33f, 38; 10:1, 8; 12:20, 24, 26ff, 35; 13:52; 15:17; 17:19; 21:12, 39; 22:13; 25:30; Mark 1:12, 34, 39, 43; 3:15, 22f; 5:40; 6:13; 7:26; 9:18, 28, 38, 47; 11:15; 12:8; 16:9, 17; Luke 4:29; 6:22, 42; 9:40, 49; 10:2, 35; 11:14f, 18ff; 13:28, 32; 19:45; 20:12, 15; John 2:15; 6:37; 9:34f; 10:4; 12:31; Acts 7:58; 9:40; 13:50; 16:37; 27:38; Gal 4:30; Jas 2:25; 3 John 1:10; Rev 11:2. NAS = brings(3), cast(28), casting(5), casts(5), drive(4), driven(1), drove(4), eliminated*(1), leads(1), leave(1), put(2), puts(1), puts forth(1), putting(1), scorn(1), send(2), sending...away(1), sent(3), sent...away(1), take(6), threw(3), throw(3), throwing(1), thrown(1), took(1). We have a bat's eye for our own faults, and an eagle's for the faults of others. It is a beam. You do not see it because it is in your own eye. How is it that you can be so severe towards that which is in another, and so lenient towards yourself? We are hypocrites when we judge and condemn others without first judging ourselves. When we become provoked by the faults of others and have far bigger faults it our own life we are hypocrites. When we are acting out the part of righteous speck removers, oblivious to our own sin, we are hypocrites! Never put your finger on someone's faults unless it is part of a helping hand. Two extremes must be avoided in this matter of spiritual self-examination. The first is the deception of a shallow examination. Sometimes we are so sure of ourselves that we fail to examine our hearts honestly and thoroughly. A quick glance into the mirror of the Word will never reveal the true situation (James 1:22-25). Sometimes we get so wrapped up in self-examination that we become unbalanced. But we should not look only at ourselves, or we will become discouraged and defeated. We should look by faith to Jesus Christ and let Him forgive and restore us. Satan is the accuser (Rev 12:10), and he enjoys it when we accuse and condemn ourselves! After we have judged ourselves honestly before God, and have removed those things that blind us, then we can help others and properly judge their works. "The tendency toward hypocrisy shows itself in many subtle ways. Have you ever noticed how we like to "rename" our sins? We do that by ascribing the worst motives to others, while using other phrases to let ourselves off the hook. If you do it, you're a liar; I merely "stretch the truth." If you do it, you're cheating; I am "bending the rules." You lose your temper; I have righteous anger. You're a jerk; I'm having a bad day. You have a critical spirit; I bluntly tell the truth. You gossip; I share prayer requests. You curse and swear; I let off steam. You're pushy; I'm intensely goal-oriented. You're greedy; I'm simply taking care of business. You're a hypochondriac; but I'm really sick. First, take the log out by asking God to show us our sins, for until we have done this bit of spiritual surgery, the “speck” in our brother’s eye will look like a log to us and we won’t be able to see the log in our own eye. Once the Spirit has been allowed to perform His painful surgery and we have confessed, repented and mourned over our own sin, then we ready to function as ministers in the "speck removal ministry" and perform surgery on someone else. How do you know you are seeing clear enough to perform is delicate surgery on another's eye? Your own sins will bother you a lot more than the sins of others. The failures of others won’t seem so huge to you. And finally you will know you’re ready to talk to a brother or sister when you don’t want to do it any more. The person who has judged himself rightly will display humility, godly sorrow, gentleness, tenderness, restraint, longsuffering and cautious reserve in their speech. Then you are ready to judge rightly and remove the speck in your brother's eye. See clearly (1227) (diablepo from dia = through + blepo = see) means literally to see through and so to look intently or view attentively. To be able to see fully or to stare with eyes wide open so that one can distinguish clearly. Take out (1544) (ekballo from ek = out of + ballo = cast, throw) means to cast or throw out. As someone has wisely put it, don't put your finger on someone's faults unless that "finger" is part of a "helping hand". If we would prayed it and meant it, we would all do a lot more confessing and a lot less judging. I’d like to suggest a simple prayer for the Holy Spirit to take over your life. Saying words alone won’t change your heart, but if these words reflect your deepest desire, then today could be a new beginning for you. Heavenly Father, our problem is not with your Word. We know what it says. And our problem is not with other people, not even the ones who have hurt us deeply. Our problem is on the inside. For too long we have tried to solve our own problems and it has not worked. We confess that too many times we have been critical of those around us. Forgive us our thoughtless, unkind, hurtful words. O Lord, show us a better way! Without you, we will never change. Lord Jesus, thank you for showing us how to live. Thank you for showing us how to die. Thank you for showing us how to forgive the people who have hurt us the most. Holy Spirit, fill us with your power so that we might become truly different people. Set us free from bitterness, from anger, and from a judgmental spirit. Grant us power to love each other. Make us like Jesus, full of grace and truth. And do it now, in this moment, as we pray this prayer. Amen. Speckology And Plankitis - According to Jesus, it's a bad idea to major in "speckology" while suffering from "plankitis." During His Sermon on the Mount, our Lord said, "Why do you look at the speck in your brother's eye, but do not consider the plank in your own eye?" (Matthew 7:3). "The identifying and criticizing of small shortcomings in the lives of everyone around you. Very popular course; fills early." "A disease that distorts self-perception and renders an individual incapable of recognizing personal faults. Occurs worldwide." "remove the plank from your own eye, and then you will see clearly to remove the speck from your brother's eye" (Mt 7:5). Be quick to judge yourself but slow to judge others. A lady in Switzerland bought a small package of greatly aged cheese. Putting it into her handbag, she continued her shopping in different stores. She was greatly repelled at what she thought to be the malodor of the different clerks encountered. Her thoughts ran something like this: "How can these ill-smelling clerks maintain their positions?" Imagine her embarrassment when, upon opening her hand bag, she discovered that it was she, not others, who was responsible for the offensive odor! Who's Guilty? - A North Carolina man accused his estranged wife of being married to two men. When the woman was arrested, she didn't deny the charge of bigamy. She not only admitted her guilt, but she also told authorities that she must have been crazy to get married twice without having gone through divorce or widowhood. That was only half the story. What surprised her, she said, was that her husband would turn her in, because he was guilty of the same crime. When the countercharges were explored, the husband admitted that he too was illegally married to two women. This husband is an example of what Jesus described in Matthew 7:1-5. While having a "plank" in his own eye, the man pointed critically to a "speck" in the eye of his wife. Both had broken the law by being married to two people at the same time. His sin, however, was the greater because he was arrogant to think that he could get away with judging another person for the same sin he was committing. The message is clear. Christ shows mercy to us when we admit our sin, but He judges our hypocrisy and pride when we refuse to be humbled in His presence. That you have no sins of your own. —Anon. we see the sins of others but not our own. When To Judge - Many people believe that Christians are told never to judge others. As “proof,” they quote Jesus’ words in Matthew 7: “Judge not, that you be not judged” (Mt 7:1). But a closer look at what Jesus said shows that there are times when we must make judgments. To follow Jesus’ teaching, we must learn the difference between judging people and evaluating situations. But who among us is wise enough to consider any situation without condemning or judging the persons involved? That is why, in Mt 7:7-11, we are told to earnestly ask, seek, and implore help from our heavenly Father. “Your Father who is in heaven [will] give good things to those who ask Him” (Mt 7:11). The righteous Judge gives discernment to those who ask Him. Begin at home — that is the teaching; not at home in the general sense, with other members of thy family, but very close at home, with thyself. It is a good deal easier, of course, to pull motes out of other people’s eyes than beams out of one’s own. Yet we are not put in this world to look after other people’s faults, to pick the dust out of their eyes, to remove their specks of blemish. Our first business is to get rid of our own faults. At least we are scarcely competent to take the grain of dust out of another’s eye while a beam protrudes from our own. We are not ready to do much toward curing our friend of his faults until we have sincerely tried to rid ourselves of our own. We all know people whose very presence is a silent rebuke of sin. Their lives are pure and holy, and their unconscious influence is a restraint upon all evil. We are ofttimes told that one of the truest tests of a good friendship is that our friend can tell us of our faults and we shall receive it kindly. That depends first on ourselves, and then upon our friend. If we are proud and vain, it will be very hard for any friend, the wisest and gentlest, to speak to us of our faults, save at the peril of the friendship. Then if the friend treats our faults in a conceited and censorious way, it will be equally dangerous. He who would truly help to take the motes out of our eyes must come to us in tender love, proving his generous and unselfish interest in us. He must come to us humbly, not as our judge but as our brother, with faults like our own which he is trying to cure. If he approaches us in this way, conscious of his own infirmity, desiring to be helpful to us, as Christ has been helpful to him, nothing but unpardonable vanity and self-conceit will prevent our accepting his kind offer. I. How can we help ‘judging,’ and why should we not ‘judge’? The power of seeing into character is to be coveted and cultivated, and the absence of it makes simpletons, not saints. Quite true: but seeing into character is not what Jesus is condemning here. The ‘judging’ of which He speaks sees motes in a brother’s eye. That is to say, it is one-sided, and fixes on faults, which it magnifies, passing by virtues. Carrion flies that buzz with a sickening hum of satisfaction over sores, and prefer corruption to soundness, are as good judges of meat as such critics are of character. That Mephistophelean spirit of detraction has wide scope in this day. Literature and politics, as well as social life with its rivalries, are infested by it, and it finds its way into the church and threatens us all. The race of fault-finders we have always with us, blind as moles to beauties and goodness, but lynx-eyed for failings, and finding meat and drink in proclaiming them in tones of affected sorrow. How flagrant a breach of the laws of the kingdom this temper implies, and how grave an evil it is, though thought little of, or even admired as cleverness and a mark of a very superior person, Christ shows us by this earnest warning, embedded among His fundamental moral teachings. He points out first how certainly that disposition provokes retaliation. Who is the Judge that judges us as we do others? Perhaps it is best to say that both the divine and the human estimates are included in the purposely undefined expression. Certainly both are included in fact. For a carping spirit of eager fault-finding necessarily tinges people’s feelings towards its possessor, and he cannot complain if the severe tests which he applied to others are used on his own conduct. A cynical critic cannot expect his victims to be profoundly attached to him, or ready to be lenient to his failings. If he chooses to fight with a tomahawk, he will be scalped some day, and the bystanders will not lament profusely. But a more righteous tribunal than that of his victims condemns him. For in God’s eyes the man who covers not his neighbour’s faults with the mantle of charity has not his own blotted out by divine forgiveness. This spirit is always accompanied by ignorance of one’s own faults, which makes him who indulges in it ludicrous. So our Lord would seem to intend by the figure of the mote and the beam. It takes a great deal of close peering to see a mote; but the censorious man sees only the mote, and sees it out of scale. No matter how bright the eye, though it be clear as a hawk’s, its beauty is of no moment to him. The mote magnified, and nothing but the mote, is his object; and he calls this one-sided exaggeration ‘criticism,’ and prides himself on the accuracy of his judgment. He makes just the opposite mistake in his estimate of his own faults, if he sees them at all. We look at our neighbour’s errors with a microscope, and at our own through the wrong end of a telescope. We see neither in their real magnitude, and the former mistake is sure to lead to the latter. We have two sets of weights and measures: one for home use, the other for foreign. Every vice has two names; and we call it by its flattering and minimising one when we commit it, and by its ugly one when our neighbour does it. Everybody can see the hump on his friend’s shoulders, but it takes some effort to see our own. David was angry enough at the man who stole his neighbour’s ewe lamb, but quite unaware that he was guilty of a meaner, crueller theft. The mote can be seen; but the beam, big though it is, needs to be ‘considered.’ So it often escapes notice, and will surely do so, if we are yielding to the temptation of harsh judgment of others. Every one may be aware of faults of his own very much bigger than any that he can see in another, for each of us may fathom the depth of our own sinfulness in motive and unspoken, unacted thought, while we can see only the surface acts of others. Our Lord points out, in verse 4, a still more subtle form of this harsh judgment, when it assumes the appearance of solicitude for the improvement of others, and He thus teaches us that all honest desire to help in the moral reformation of our neighbours must be preceded by earnest efforts at mending our own conduct. If we have grave faults of our own undetected and unconquered, we are incapable either of judging or of helping our brethren. Such efforts will be hypocritical, for they pretend to come from genuine zeal for righteousness and care for another’s good, whereas their real root is simply censorious exaggeration of a neighbour’s faults; they imply that the person affected with such a tender care for another’s eyes has his own in good condition. A blind guide is bad enough, but a blind oculist is a still more ridiculous anomaly. Note, too, that the result of clearing our own vision is beautifully put as being, not ability to see, but ability to cure, our fellows. It is only the experience of the pain of casting out a darling evil, and the consciousness of God’s pitying mercy as given to us, that makes the eye keen enough, and the hand steady and gentle enough, to pull out the mote. It is a delicate operation, and one which a clumsy operator may make very painful, and useless, after all. A rough finger or a harsh spirit makes success impossible. II. Verse 6 comes in singular juxtaposition with the preceding warning against uncharitable judgments. Christ’s calling men dogs and swine does not sound like obeying His own precept. But the very shock which the words give at first hearing is part of their value. There are men whom Jesus, for all His gentleness, has to estimate thus. His pitying eyes were not blind to truth. It was no breach of infinite charity in Him to see facts, and to give them their right names; and His previous precept does not bid us shut our eyes, or give up the use of common sense. This verse limits the application of the preceding one, and inculcates prudence, tact, and discernment of character, as no less essential to His servants than the sweet charity, slow to suspect and sorrowful to expose a brother’s fault. The fact that His gentle lips used such words may well make us shudder as we think of the deforming of human nature into pure animalism which some men achieve, and which is possible for all. This precept is one side of the truth. The other is the adaptation of the gospel to all men, and the obligation on us to preach it to all. We can only tell most men’s disposition towards it by offering it to them, and we are not to be in a hurry to conclude that men are dogs and swine. III. It may be a question whether, in verse 8, the emphasis is to be laid on ‘every one’ or on ‘that asketh,’ or, in other words, whether the saying is an assurance that the universal law will be followed in our case, or a statement of the universal condition without which no receiving is possible, and, least of all, the receiving of the gifts of the kingdom by its subjects. In either case, this verse gives the reason for the preceding exhortation. Then follows the tender illustration in which the dim-sighted love of earthly fathers is taken as a parable of the all-wise tenderness and desire to bestow which move the hand of the giving God. There is some resemblance between an Eastern loaf and a stone, and some between a fish and a serpent. However imperfect a father’s love, he will neither be cruel enough to cheat his unsuspecting child with what looks like an answer to his wish but is useless or hurtful, nor foolish enough to make a mistake. All human relationships are in some measure marred by the faults of those who sustain them. What a solemn attestation of universal sinfulness is in these words of Christ’s, and how calmly He separates Himself by His sinlessness from us! I do not know that there is anywhere a stronger scriptural proof of these two truths than this one incidental clause, ‘ye, being evil.’ I wonder whether the people who pit the Sermon on the Mount against evangelical Christianity are ready to take this part of it into their creeds. It is noteworthy, also, that the emphasis is laid, not on the earthly father’s willingness, but on his knowing how to give good gifts. Our Lord seems to think that He need not assure us of the plain truth that of course our Father in heaven is willing, just because He is our Father, to give us all good; but He heartens us with the assurance that His love is wisdom, and that He cannot make any mistakes. There are no stones mingled with our bread, nor any serpents among the fish. He gives good, and nothing but good. IV. The great precept which closes the section is not only to be taken as an inference from the immediately preceding context, but as the summing up of all the duties to our neighbours, in which Christ has been laying down the law of the kingdom from Matthew 5:17. But a connection may also be traced with the preceding paragraph. There our desires were treated as securing God’s corresponding gifts. Here our desires, when turned to men, are regarded, not as securing their corresponding conduct, but as obliging us to action. By taking our wishes as the rule of our dealings with others, we shall be like God, who in regard to His best gifts takes our wishes as the rule of His dealings with us. Our desires sent heavenward procure blessings for us; sent earthward, they prescribe our blessing of others. That is a startling turn to give to our claims on our fellows. It rests on the principle that every man has equal rights, therefore we ought not to look for anything from others which we are not prepared to extend to others. A. should give B. whatever A. thinks B. should give him. Our error is in making ourselves our own centre, and thinking more of our claims on others than of our obligations to them. Christ teaches us that these are one. Such a principle applied to our lives would wonderfully pull down our expectations and lift up our obligations. It is really but another way of putting the law of loving our neighbours as ourselves. If observed, it would revolutionize society. Nothing short of it is the law of the kingdom, and the duty of all who call themselves Christ’s subjects. OBSERVATION and experience shew, that the less any person is acquainted with his own infirmities, the more he will be disposed to censure the infirmities of others. But as such a disposition is totally repugnant to that love which Christianity inculcates, our Lord cautioned his hearers against it, and taught them, in the parable before us, to scrutinize and reform themselves before they presumed to take upon themselves the office of censuring and reclaiming others.